The Ford E series (also known as the Ford Econoline and Ford Club Wagon throughout various stages of its production) is a range of full-size vans produced by the American automaker Ford since 1960. Introduced for the 1961 model year as the replacement for the Ford F-series panel van, four generations of the model line have been produced. In addition to cargo van and passenger van body styles, the Ford E series has been produced as a cutaway van chassis and stripped chassis (a chassis without bodywork). With a 56-year production run, the Ford E series is the second longest-produced nameplate by Ford worldwide; only the Ford F series (1948–present) has been produced longer. For the 2015 model year, the Ford E series cargo/passenger vans were replaced in North America by the Ford Transit introduced worldwide in 2013. As of the 2017 model year, only cutaway and stripped chassis configurations of the E series are produced. Since 2006, the E series has been assembled at the Ford Motor Company Ohio Assembly plant in Avon Lake, Ohio. From 1961 to 2005, the Ford E series was assembled at Lorain Assembly in Lorain, Ohio. 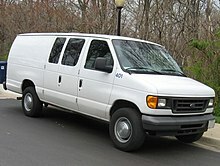 Prior to its discontinuation, the Ford E-series cargo/passenger van was the best-selling full-size van in the United States since 1980; in 2007, the model held a 79.6% share of the full-size van segment. Commercial or fleet users represented 95% of sales, with cargo vans accounting for nearly half of production. The first generation of the Ford Econoline made its debut on September 21, 1960. Introduced for the 1961 model year as a cargo van, pickup truck, and a passenger van (Station Bus/Club Wagon), the Econoline began development based on design sketches that were dated 1957. While introduced alongside the Chevrolet Corvair van for 1961, the Ford Econoline established many design precedents adopted by successive designs of American vans, including the Chevrolet Van and Dodge A100 (and the European Ford Transit). While remaining a forward-control vehicle, Ford adopted a mid-engine configuration. As the engine was placed between the front seats instead of behind the rear axle as on the Corvair, a larger rear door and flat load floor was created, allowing for additional load capacity. The first-generation Ford Econoline was produced from 1961 to 1967. In a similar fashion that the Volkswagen Bus (VW Type 2) derived its underpinnings from the Volkswagen Beetle, the first-generation Ford Econoline was based upon the Ford Falcon compact car range. To accommodate its 90-inch wheelbase (the shortest for a Ford since 1908), the Econoline adopted a mid-engine configuration, placing the engine behind the front axle; consequently, the layout precluded the use of a V8 engine. In contrast to the Falcon, the Econoline was fitted with a solid front axle and a solid rear axle suspension with leaf springs for all four wheels. In its layout, the Ford Econoline adapted several elements of the Volkswagen Type 2, while making major departures with other design features, with many elements of its design derived from its mid-engine layout. In line with Volkswagen, the Econoline positioned the front seats above the front axle, making it a cabover-style configuration, similar to the Jeep Forward Control. Other elements of its design were borrowed loosely from the Ford Thames 400E produced by Ford of Britain (the predecessor of the Ford Transit), including its grille configuration. The use of a mid-engine layout enlarged the cargo area, as the engine compartment was relocated forward of the load floor (which was flattened). While Volkswagen would market the Type 2 in the United States until 1979, the configuration of the Econoline was adopted by Chevrolet/GMC in 1964 (replacing the Corvair-based Greenbrier van) and the 1964 Dodge A100. 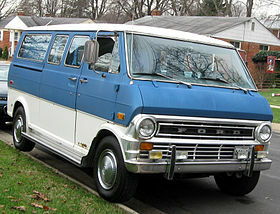 Through its production, the first-generation Ford Econoline was offered in several variants, with four versions of the cargo van. Along with the 6-door windowless cargo van, Ford introduced an 8-door cargo van in 1963, adding two doors to the driver side. In 1964, a panel van variant was introduced, deleting the side loading doors. 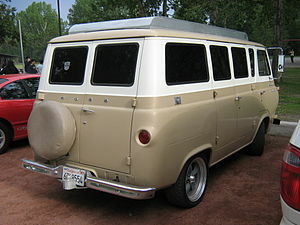 Cargo vans (with the exception of the panel van) were offered with or without windows in several configurations. In 1965, Ford introduced a "Super Van" variant of the Econoline, extending the body 18 inches behind the rear axle. 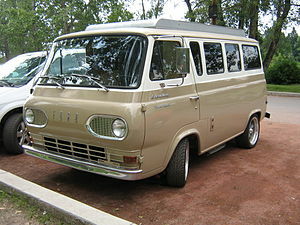 Alongside the Ford Falcon, the Ford Econoline was expanded into a product line including several vehicles. In Canada, the Econoline was marketed through both the sales networks of both Ford and Lincoln-Mercury (as a Mercury), to increase its presence outside of urban areas. Introduced alongside the cargo van in 1961, Ford introduced two passenger variants of the Econoline (branded as part of the Falcon range) Alongside the Station Bus (branded as both a Falcon and Econoline), Ford marketed the Club Wagon. While the Station Bus was largely intended for commercial/fleet use, the Club Wagon was marketed as an alternative to station wagons. A five-seat configuration was standard, with an eight-seat configuration offered as an option. Introduced as part of the Econoline model line for 1961, the Ford Econoline pickup truck was based upon the cargo van. Sharing the forward-control configuration of the Chevrolet Corvair pickup, through its mid-engine chassis, the Econoline pickup truck saw no engine intrusion into the cargo bed. Although, in 1965 with the offering of the larger 240 cubic-inch engine there was a slight intrusion into the cargo bed providing clearance for the larger transmission bellhousing. The Econoline pickup was offered in two window configurations: 3 windows and 5 windows with windows in the rear cab corners to provide better visibility. Early in 1965 the pickup was offered as a Spring Special with a special trim package. While far shorter than an F-100, the pickup was configured with a seven-foot long cargo bed. The Econoline pickup was only produced during the first generation of production, ending production after the 1967 model year. In 1961, Ford projected the pickup leading the van in sales; however, buyer preferences shifted towards the van configuration, as the pickup accounted for 10% of 1961 Econoline production. The first-generation Econoline was sold by Ford of Canada by both Ford and Mercury. Alongside the M-series truck line, the Mercury Econoline allowed for Ford of Canada to maximize its presence in rural areas served by either a Ford or a Lincoln-Mercury dealer network, but not both. Largely identical to its Ford counterpart with only minor exceptions of badging, the Mercury Econoline product line was sold as a pickup, cargo van, and passenger van. In 1961, the pickup truck commenced production at Oakville Assembly in Canada; later that year, Mercury Econoline pickup production shifted to the Lorain, Ohio assembly plant. From 1962 to 1965, Mercury sourced Econoline vans and pickups from Oakville, with all later vehicles imported from the United States. Production numbers of Mercury Econolines were low; for example, a total of 1,291 Mercury Econoline pickup trucks were built in 1965. During 1968, Mercury ended its sale of light trucks, discontinuing the M series. Subsequently, the next van sold by Mercury was the 1993 Mercury Villager minivan. As the result of a lengthy United Auto Workers strike in 1967, the launch of the second-generation Econoline van was delayed almost four months until January 1968. Instead of calling it a 1968 or 1968.5 model, Ford decided to call it the 1969 model. Shedding its Falcon roots, the second-generation Econoline became a heavier-duty vehicle, sharing many of its underpinnings with the F-series full-size pickups. While the unibody construction of the previous-generation van was carried over, a major change was made in the overall layout in the body and chassis of the Econoline. To build a heavier-duty chassis, the mid-engine forward-control layout was abandoned in favor of a front-engine layout with the axle placed forward; this also allowed the use of the "Twin I-Beam" front suspension used in the F-series trucks. The redesign in the configuration resulted in major growth; the Econoline grew 15 inches in wheelbase; an 18-inch longer long-wheelbase model became the largest full-size van offered in North America at the time. As they had become introduced as options in Dodge and Chevrolet/GMC vans, Ford introduced a V8 engine option into the powertrain line. With the change of chassis and axle configurations, the Econoline gained a conventional hood for engine access (though most engine access remained from the interior). To aid in engine compartment ventilation, the model was given a conventional grille, styled similar to the F series. For 1971, the grille was redesigned to match the updated F series. 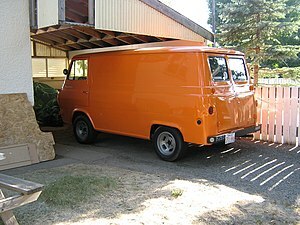 For 1972, a sliding rear door became an option; introduced on a cutaway van chassis was the Hi-Cube van, a cab-chassis version of the Econoline with a box-van body. The introduction of the cab-chassis variant would become popular in the recreational-vehicle industry (a Class C RV), a segment still dominated by the E series in the 2010s. Inside of the Econoline, the shift of the engine location moved the engine housing from between the seats to in front of the driver and front passenger, under the windshield. While the Econoline cargo van remained, it was joined by an Econoline passenger van (replacing the Falcon van). To attract more buyers to passenger vans, Ford introduced two new trims of the passenger van, the Ford Club Wagon and Ford Club Wagon Chateau. Based on the long-wheelbase version, the Chateau had air conditioning, houndstooth fabric on all seats, an AM/FM sound system, and the option of 12-passenger seating. For 1975, the Econoline/Club Wagon were given a complete redesign. Based on an all-new chassis, Ford became the first American manufacturer to adapt body-on-frame construction to a full-size van. The new-generation Econoline would become common not only in its own right, but as the basis for other vehicles. With a full frame, the Econoline became popular as a cutaway van chassis; the design served as a basis for many ambulances, and various types of trucks and buses. The shared drivetrain with the F series marked the beginning of aftermarket four-wheel drive conversions. During the 1970s, the Econoline became popular as a basis for van conversions. Using the sparsely-equipped Econoline cargo van as a basis, a luxurious interior was fitted, along with extensive customization of the exterior. A stillborn variant of the Econoline, the Ford Carousel, nearly reached production as the first American minivan. While a running prototype was produced and planned for a potential 1975–1976 introduction, lack of funding led to the discontinuation of the project. To increase the versatility of the full-size van line, the Econoline was developed using body-on-frame construction for the first time. In addition to increasing the strength of the chassis, the configuration allowed more commonality with the F-series trucks. As before, the Twin I-Beam front suspension was used. In its new configuration, the engine was moved further forward and lowered, relative to the body. In a massive growth spurt, the short-wheelbase configuration was 0.5 inches longer than the previous long-wheelbase chassis; the new long-wheelbase chassis was 138 inches, the longest wheelbase full-size van sold until 1990. In 1988, the 124-inch wheelbase was discontinued, leaving the 138-inch wheelbase as standard. In 1982, to increase the fuel economy of the Econoline without a major loss in engine output, Ford introduced the option of a 6.9L IDI diesel V8 produced by International Harvester; in 1988, this was enlarged to 7.3L. The diesel V8 engines were available only in Econoline 350s (or Club Wagons sold on the same chassis). Due to the popularity of automatic transmissions in full-size vans, Ford discontinued the 3-speed manual and 4-speed manual transmissions after the 1987 model year. 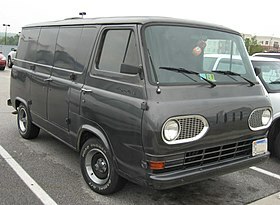 Unlike its predecessors, Ford designed the 1975 Econoline with a true "two-box" layout. Similar to the Ford Transit of the time, the configuration moved the engine as far forward as possible and lower in the chassis than in its predecessor; although the hood was nearly twice as long, the hoodline was much lower. A higher degree of parts commonality with the F series made itself known in the bodystyling: the vent windows, taillights, bumpers, and wheels were common items between the two vehicles. During its sixteen-year production run, the exterior of the Econoline/Club Wagon would remain nearly unaltered. In 1978, the Super Van/Super Wagon was introduced; based on the 138-inch wheelbase, it was a rear body extension allowing for extra cargo room or an extra row of seating (for up to 15 passengers). In 1979, a minor facelift updated the grille design; round headlights were replaced by rectangular units. In 1983, the Ford Blue Oval was added to the grille, replacing the "FORD" lettering on the hood. Although the 1986 Ford Aerostar minivan would introduce styling far different from the Econoline, the basic styling of the full-size van would heavily influence the Ford Ranger (and its SUV offspring, the Ford Bronco II). For the 1992 model year, Ford introduced the fourth generation of the Econoline/Club Wagon. While the third-generation chassis was largely carried over, the body and interior underwent a complete redesign. As with the smaller Ford Aerostar, the fourth-generation model line was offered two body lengths on a common wheelbase. The fourth-generation Econoline/Club Wagon underwent several revisions during its production. For 2001, to adopt a nomenclature closer in line to that of Ford full-size trucks, the Econoline was renamed the E-Series. In June 2014, production of E-Series passenger and cargo vans was discontinued as sales of the Ford Transit began in North America. From 2015 onward, the E-Series has remained in production solely for commercial markets in cutaway-cab and stripped chassis configurations. In 2019, Ford unveiled its first revision to the E-Series in its production as a commercial vehicle chassis, with revisions to its drivetrain, a new steering column, and wiring updates to improve functionality of equipment installed during manufacturing; it is announced for the 2021 model year. The fourth-generation E-Series (Econoline/Club Wagon) shares the VN platform of the third-generation Econoline, introduced in 1975. Sharing many components with F-Series trucks, the E-Series retained the "Twin I-Beam" front suspension used by rear-wheel drive Ford trucks in North America from the 1960s to the early 1990s. The rear suspension was a live rear axle with rear leaf springs. For the 2008 model year, the chassis underwent its largest revisions of the fourth generation. In an effort to improve handling and safety, larger brakes were added, improved steering, rollover stability control, and a higher GVWR. The Twin I-Beam layout was retained (making it the last Ford vehicle to use it). At its 1992 launch, the fourth-generation E-Series (Econoline/Club Wagon) carried over its powertrain line from the third-generation model line (sharing it with the ninth-generation F-Series). A 4.9L inline-6 was standard, with a 4.9L V8, a 5.8L V8 offered as options. On 250 or 350-series vans, a 7.5L V8 and 7.3L Navistar diesel V8 were also optional; the diesel became turbocharged in 1993. During 1994, the IDI diesel was replaced by a 7.3L Ford Powerstroke diesel V8 (also sourced from Navistar). For 1997, the E-Series underwent a revision of its engine lineup, retaining only the 7.3L diesel. Sharing its gasoline engines with the tenth-generation F-Series, a 4.2L V6 replaced the inline-6 and a 6.8L V10 replaced the 7.5L V8. The 4.9L and 5.8L V8s were replaced by 4.6L and 5.4L V8s, respectively. 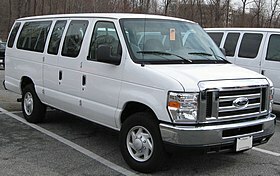 The 6.0L Power Stroke was offered until 2009 in the Ford Econoline vans (model year 2010), even though Ford Super Duty trucks were upgraded to the 6.4 version in 2007. Diesels were no longer offered after the 2010 model year. For 2009, the E-Series gained flexible-fuel capability with 4.6L and 5.4L engines (allowing them to use E85). In May 2014, the final 4.6L V8 was produced for the E-Series, with the 5.4L V8 becoming the standard engine for 2015. For 2017, the 6.8L V10 replaced the 5.4L V8 as the standard engine, with a 6.2L V8 becoming the optional engine; along with flex-fuel capability, both engines were offered with options for conversion to CNG or LPG/propane. For its 2021 model year revision, the E-Series cutaway cab adopts the 7.3L V8 of the 2020 Super Duty trucks. During its production, the fourth-generation vans underwent minor revisions in 1997 and 2003, with a major revision in 2008; cutaway-chassis vans have undergone a revision for the 2021 model year. In line with the F-Series, the Econoline was sold in 150, 250, and 350 series, denoting ½, ¾, and 1-ton chassis (the Club Wagon was not designated by chassis size). The body was available in two lengths, with the extended-length version exclusive to the 350-series (1-ton) chassis for both cargo and passenger vans. The cargo van was sold as a two-passenger vehicle, with the passenger van sold in various configurations, including 5, 8, 9, 12, and 15 passengers. For the 1992 model year, the body of the Econoline underwent a complete redesign. The two-box configuration made a return, although the hood was angled downward slightly and the windshield raked back; all window glass (if specified) was flush-mounted. Flush-mounted taillamp lenses were specific to the model line, along with flush-mounted headlamps (the latter were an option, standard on Club Wagons). For 1992, the Econoline/Club Wagon became the first full-size vans produced with a center-mounted brake light. For 1995, the taillamps were revised, removing the amber turn signals. When redesigning the interior of the E-series for 1992, Ford chose to modernize the driver compartment of the vehicle. Sharing its controls and components with the Ford F-series and Aerostar, the E-series/Club Wagon was notable for being the first full-size van equipped with a driver's side airbag as standard equipment (on all models except the Econoline 350). While space between the front seats was again dominated by the front engine cover, the redesign freed up additional passenger room. While the model line offered only analog instruments (and no tachometer), a 6-digit LCD odometer replaced the previous 5-digit analog odometer. For 1994, CFC-free R134a air-conditioning refrigerant was adopted beginning with September 1993 production. For 1997, the grille was redesigned. To bring the exterior of the Econoline in line with other Ford trucks, the egg-crate grille was replaced with an eight-hole oval-shaped cutout (matching the Ford Explorer and F-150). The interior saw a complete redesign of the dashboard, adopting dual airbags (for all models). The "brick"-style steering wheel was replaced with one using a horn mounted in the center; a double-DIN radio was added, along with an analog odometer. For 2003, the entire E-Series adopted the grille of the E-550, shifting the Ford Blue Oval from the hood to the grille (for the first time since 1991). In another revision, the front turn signal lenses become amber in color. For 2004; the front bumper is revised with additional cooling slots. For 2003, coinciding with the exterior facelift, the interior received a new engine cover with redesigned cup holders. For the first time since 1974, the E series was given a glove box, shared with the Super Duty trucks. For 2004, the instrument panel was given a digital odometer, last used in 1996, certain versions were available with a tachometer. For 2002, a heavy-duty E-550 variant was introduced. Sharing chassis components with the Super Duty, the E-550 was distinguished by a grille styled in line with Super Duty pickup trucks (with a three horizontal slots between two vertical openings). In addition, the heavier-duty front axle required the use of a larger front bumper and plastic fender flares (shared with the F-550 truck). Depending on trim, E-550s were fitted with either chrome grilles, chrome bumpers, and flush headlamps, or gray plastic grilles, bumpers, and sealed-beam headlamps. After the 2003 model year, the E-550 was discontinued. For the 2008 model year, the E-Series underwent a major update. Largely concentrated forward of the windshield, the E-Series received new fenders, hood, and a larger grille. For 2009, the dashboard was completely redesigned, with only the steering column carried over. Designed to share components with the Super Duty trucks, the E series now comes with the Ford Sync system, in-dash navigation as an option, and integrated auxiliary switches. The glovebox was relocated from the engine cover to forward of the passenger seat. Another option first introduced on the vehicle is a rear-view backup camera; widely available on smaller vehicles, it is the first in the full-size van segment. During its production, the fourth-generation model line underwent several name changes. As with the previous generation, the Econoline was sold as both a cargo van and as a passenger van (Econoline Wagon) with the Ford Club Wagon sold only as a passenger van. For 1992, the luxury-oriented Chateau trim line of the Club Wagon made its return (dormant since 1980), slotted above the XL and XLT trims. For 1992, the Club Wagon Chateau was awarded Truck of the Year by Motor Trend. Toward the end of the 1990s, Ford began to phase out the use of the Econoline and Club Wagon nameplates. For 1999, the Club Wagon nameplate was discontinued (in favor of Econoline Wagon). 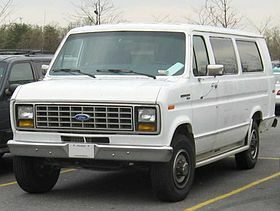 After the 2000 model year, the Econoline was renamed the Ford E-Series in the United States, in line with the Ford F-Series trucks (done by Ford Canada in 1995). For 2001, the Chateau was dropped, replaced by the E-150 Traveler; due to low sales, it was dropped after a single model year. For 2011, to commemorate the 50th year of production, Ford offered a 50th Anniversary Edition of the E-Series. Offered on XLT Wagons, the option package was distinguished by blue metallic paint, embroidered seatbacks, and exterior badging. As part of the OneFord plan, Ford introduced the Ford Transit in North America for the 2015 model year. Developed as a replacement for the E-Series passenger and cargo van, the Transit was co-developed by Ford in North America, with a full line of passenger, cargo, cutaway, and chassis-cab configurations. To accommodate demand for second-stage manufacturers, from the 2015 model year onward, the E-Series has continued production for commercial use solely in cutaway and stripped-chassis configuration. In 2014, Ford initially announced the continuation of E-Series commercial production (alongside the Transit cutaway/chassis cab) through the 2010s. In 2019, the lifespan of the E-Series was extended into the 2020s as Ford unveiled a 2021 update for the E-Series cutaway. While the exterior remains unchanged since its 2008 redesign, the 6.8L V10 is replaced by a 7.3L V8. The interior sees several revisions, with an all-new steering column (for the first time since 1997), a redesigned instrument cluster, and increased connectivity. ^ "Plant Information: Oakville Assembly Complex". Media.ford.com. Archived from the original on June 14, 2010. Retrieved May 31, 2011. ^ "Crossovers, Lincoln highlight Ford's 2007 sales performance; further growth expected in 2008". Media.Ford.com. January 3, 2009. Archived from the original on May 25, 2011. ^ "Ford Introduces The New 2008 E-Series Van". BlueOvalNews. March 7, 2007. ^ a b c "1963 Ford Falcon Van brochure". Oldcarbrochures.com. Retrieved February 6, 2014. ^ Lee, Peter (2015). Ford Transit: Fifty Years. Crowood. ISBN 9781847978745. Retrieved 29 February 2016. ^ Statham, Steve (1995). Ford Pickup Trucks. Motorbooks. pp. 71–72. ISBN 9780879389871. Retrieved 29 February 2016. ^ Gunnell, John. American cars of the 1960s. 2005. p. 212. ISBN 9780896891319. Retrieved 29 February 2016. ^ "Directory Index: FMC Trucks-Vans/1961_Trucks-Vans/1961_Ford_Econoline_Van_Brochure". www.oldcarbrochures.com. Retrieved 2018-04-17. ^ "Directory Index: FMC Trucks-Vans/1963_Trucks-Vans/1963_Ford_Falcon_Van_Brochure". www.oldcarbrochures.com. Retrieved 2018-04-17. ^ Ernst, Kurt (19 January 2014). "Hemmings Find of the Day – 1961 Ford Econolpne pickup". Hemmings. Retrieved 29 February 2016. ^ a b Truesdell, Rich (November 3, 2014). "Mercury Trucks Dare to Be Different". Vintage truck magazine. Archived from the original on 17 April 2018. Retrieved 29 February 2016. ^ "1965 Mercury Econoline pickup truck for sale". American Dream Cars. Retrieved 29 February 2016. ^ "1980 Ford Econolpne Van". Oldcarbrochures.com. Retrieved February 6, 2014. ^ a b Jonathon Ramsey (April 18, 2014). "Ford E-series chassis cabs and cutaways to survive mass transit onslaught". autoblog.com. Retrieved October 28, 2014. ^ a b c d e "New 2021 Ford E-Series Chassis Cab Debuts". Ford Authority. 2019-03-05. Retrieved 2019-03-07. ^ a b "Ford Rolls Out Super Duty-Inspired 2008 E-Series Vans". Edmunds Inside Line. March 9, 2007. Archived from the original on March 20, 2007. ^ "New ergonomic and tech options enhance 2017 Ford Transit lineup; new engine for E-series stripped chassis, cutaway". Ford Motor Company Media Center. March 1, 2016. ^ "Ford's E-Series Vans Celebrate 50 Years of Success; 2011 lineup features special anniversary edition". Media.ford.com. September 13, 2010. Archived from the original on September 12, 2011. Retrieved May 31, 2011. ^ "Ford's Transit Van continues E-Series' success". Detroit News. ^ "Ford Will Continue E-Series Cutaway/Stripped Chassis – PickupTrucks.com News". news.pickuptrucks.com. Retrieved 2016-06-22. ^ "Ford Reports Detailed Sales Results". www.theautochannel.com. Retrieved 31 July 2017. ^ "Ford Motor Company Sets New Full Year U.S. Sales Record". Theautochannel.com. Retrieved April 28, 2009. ^ a b "Ford U.S. December Retail Sales up 5 Percent – a 12-Year High; Ford America's Best-Selling Brand for Seventh Year" (Press release). USA: Ford. January 4, 2017. Retrieved August 10, 2017. ^ "Ford E-Series Sales Numbers, Figures, Results". Ford Authority. 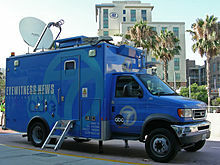 Wikimedia Commons has media related to Ford E-Series. This page was last edited on 9 April 2019, at 01:43 (UTC).